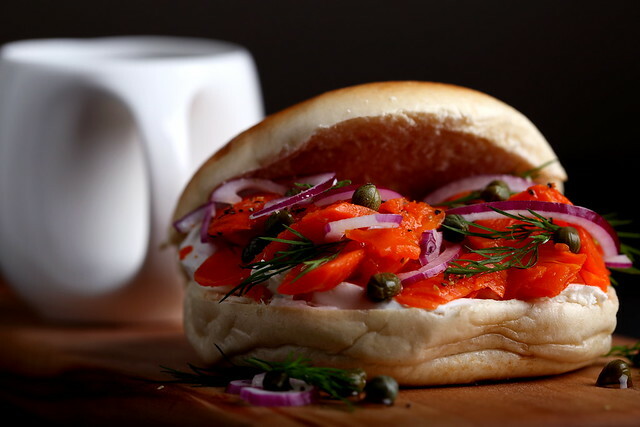 Salmon lox was one of those things that I used to eat a lot of as a pescetarian and think, “nope, never going to stop” as I piled it over a bagel smothered in cream cheese and topped with red onion and capers. I loved seeing pieces of if drenched in cream-based sauces over pasta, and dug into boxes of it during the holidays. Whenever I went to a deli, I always ordered a salmon lox bagel. The smoke, the salt, the texture—everything about it just worked. But when I went vegan, that yum turned into an ew and I was content with simply slathering vegan cream cheese onto a bagel and topping with red onion and capers instead. Because how can something so specifically textured and flavored like salmon lox be made vegan? Following the same slow, salt-roasting technique I recently did with golden beets, a vegan version of lox was easy to recreate, although it took a few tries. The one thing I discovered through making several test batches is that the secret to getting that lox-y quality is to marinate them for two or three days after slow-roasting them. They develop an impossibly soft and velvety texture during this time, and the smoke flavor mellows to a perfect level. This delicious and easy-to-make vegan lox is made from carrots! To slow roast the carrots, place one cup of coarse sea salt into a glass pyrex that offers just enough room to accommodate the length and width of the carrots so you can keep them whole. Rinse the unpeeled carrots and place them wet into the salt, making sure that the carrots are nestled in the salt and do not make contact with the bottom of the pyrex. Pour about another whole cup of salt evenly over the tops, adding a bit more as needed to ensure they are fully covered in salt. Place into the oven to roast, uncovered, for an hour and a half. Once done, tip the pyrex over onto a baking sheet and allow the carrots to cool just enough that you can handle them. Crack away and brush off any salt, then peel away the skin. It’s fine if there is still some skin left on the carrot. Then, using a mandolin or sharp knife, finely chop the carrots into jagged, thin strips. Place into a clean glass container. Drizzle over the warm carrots and toss well to coat. At this point, the flavor will not taste very “lox like”—they will need to be placed in the refrigerator for at least two days to allow the flavor to deepen and mellow, and for the carrots to get really soft and silky. When ready to serve, remove from the refrigerator and allow the carrots to come to room temperature, then serve with toasted bagels, capers, vegan cream cheese, red onion and fresh sprigs of dill as desired. I have been waiting for this recipe. if I had seen these photos independent of your blog or any explanation, I would just think, "oh, lox. that thing I used to love and eat in every hotel room for breakfast, or any chance I could…"
Me to, haha! It looks so easy and yummy! this is all sorts of genius. this really looks like the real deal, SO REAL. where can one find liquid smoke?? i am a major major fan of the lox bagel but can't do the cream cheese. vegan cream cheese is ok, but i have found a good substitute with ripe avocado. Thanks Lan! The liquid smoke is usually around the BBQ sauce, and comes in a little bottle. You can also find it on amazon. I like colgin brand. Love the avocado sub for cram cheese — that would work really well here too … I hope you enjoy! So excited about this! Would you say the thinner the better for the carrot strips or is there an ideal thickness? Naadia, it's good to have the pieces kind of jagged and irregular — some a little thick, some smaller. I hope you enjoy! Thanks Erin! Can't wait for my lox to finish marinating. I'm saving the salt too, it smells smoky and wonderful. Yes, very good idea! With fish you have to dump it, what a waste. Naadia, so happy you made! Would love to know what you think after a couple of days of marinating. Saving the salt is a great idea! This was excellent! I've had it for breakfast two days in a row now, exactly as you suggested. I'll have to try it on toast tomorrow, as we're out of bagels! I will be making this very shortly!! 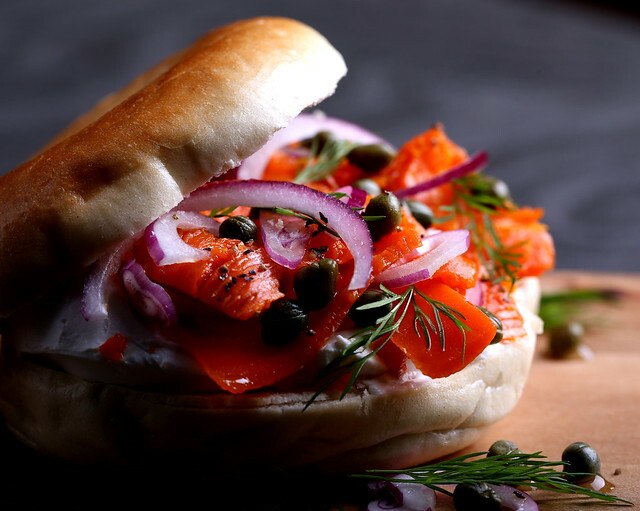 Thanks so much for your time and effort spent developing this recipe… it looks like a real winner and a great way to experience the flavor and texture of lox in a compassionate manner. Shannon, that's a great idea! I have no experience with a wood smoker, so would love your feedback if you try … I hope you enjoy! for those of us without a wood smoker, youtube has a lot of videos to show you how you can smoke your food in a regular oven, be sure to ventilate! Side note, for people with smokers, I really like to julienne carrots and onions and smoke them in a cast iron in a smoker with some bbq sauce until they are softened but not mushy. It makes the best “pulled pork” sandwiches! Hi Erin! Is there a substitute for the coconut vinegar? I have a ton of different vinegars in my pantry, but not coconut. My husband is a huge lox spread fan and I'd love to try making this version. Thank you! Jenn, I think you could sub apple cider vinegar or a white balsamic here with a similar result. I hope you enjoy! This looks so great! There is a new brand of vegan cream cheese that I'm obsessed with (Kite Hill). They've just recently started carrying it at my local Whole Foods – I would highly recommend it if it's available near you. The carrot lox would be excellent with it! Yes, I tried the Kite Hill cream cheese last week and it's phenomenal! I love this! Great technique and the outcome looks amazing. I can't wait to try it. I knew there was a reason I bought 3 giant packs of sea salt last week. Thanks Joni! Salt roasting is great. Yes, I've gone through a ton of salt since I first tried it! This definitely fits the smoky, velvety bill. And probably even better that you've never had lox, to experience the texture for what it is without comparing it to something else. I hope you enjoy, Christine! So ingenious! I'm growing oxheart carrots this year and think the surface area would go great with this-thank you! Aren't they? I fell in love with their photo in the Baker Creek Seed catalog. Have a great day! This is so cool!! Do you store the carrots in the marinade after the 2 days? How long do you suppose they will keep in the fridge? Thanks for sharing! Jenny, yep, just leave them in the marinade — the olive oil will continue to soften them and make them better the longer they sit. I have kept them in the fridge for up to one week with no issues … hope you enjoy! love to hear that! Thanks for making the recipe and your kind words. So happy you enjoyed. I'm curious. Could you sub Kosher salt instead of the sea salt?? I think that would be fine here. Good luck and I hope you enjoy, Nancy! This looks amazing, such a gorgeous vegan alternative. Thanks! This recipe turned out AMAZINGLY! Thank you so much for such a great food experience. I made a tofutti, garlic and white wine sauce to go with some pasta, and topped it with the carrot lox, dill, and a nice squeeze of lemon. Absolutely divine. My omi husband also raved about it, taking some to our neighbours (good friends) and insisted they try some. They also couldn't believe it was carrot. Win, win, win! On the shortlist for dinner parties. I don't understand how to cut the carrots. Are they cut lengthwise or cross-wise? Susan, you can cut them into any sized strips, as long as they are thin. Traditional lox comes in thin various sizes, so the cuts here should mimic that. I hope you enjoy! Wendalete, that's never happened to me! But I suspect that there wasn't enough salt on the bottom of the dish, which caused the liquid to pool and clump. I hope you were able to get it out and enjoyed the vegan lox! This is great ! I just made it and was so impressed with the results ! I put a little bit less liquid smoke and added maple syrup, brown sugar and coarse salt. In a bagel with cashew cream cheese, capers, lemon juice, red onions and dill, I could not tell the difference between that and actual lox. I am eager to experiment with this recipe (perhaps add juniper berries to the marinade ?). Many thanks for this beautiful recipe !! My omnivorous coworker was skeptical when I first told him about this recipe, but he was totally dumbfounded when he tasted the bagel and then raved about it to my other coworkers. Can't wait to try it again ! I love to hear that! Thanks so much for sharing!! I hope you enjoy, Kristi! One reader said she used the salt again but as a seasoning. As far as using it again, I am not sure. If you do with good results, please let me know! I just made my fourth batch and this time I used the salt ( still in the dish from the last batch 2 days ago) twice and it worked out just fine which is a good thing as I would hate to waste it ( was thinking to use it to melt ice if it ever gets cold enough here to freeze! ) This is such a huge hit ( I even fooled and surprised my co-worker who catches and smokes his own fish) I also didn't have coconut vinegar the first time and used Apple Cider Vinegar and it was fine too! P.S. I have tried a few other recipes from various blogs etc. but your recipe is THE best! Thank you!! Hi I can't get coconut vinegar where I live, can I use a substitute? You can try a white balsamic vinegar or try ordering the coconut vinegar on amazon … good luck! I've never tried flaxseed oil, but will definitely check it out, thanks for the recommendation! You are right about Trader Joe's vegan cream cheese — it's phenomenal. I hope you enjoy the lox! I know I will! I just put the carrot pieces into the marinade, and it already tastes like lox! I think you will love the extra element that the flaxseed oil gives. Thanks for a wonderful recipe! Hi Erin, I came across your blog when i was doing a search for RAW carrot lox. 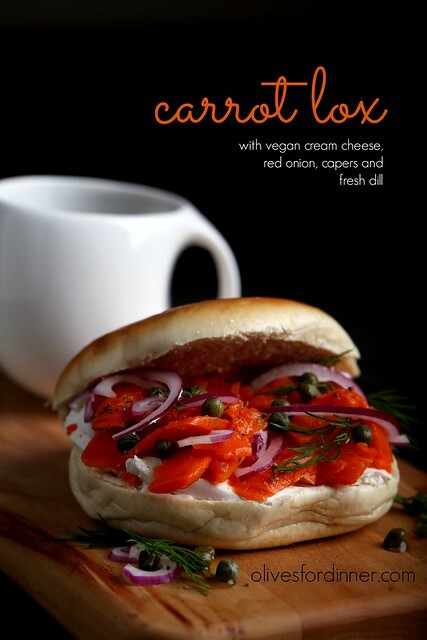 I have a plant-based assignment for a course i'm doing on raw foods, and i really would love to be able to prepare a carrot lox but was wondering if you've ever tried making this without the roasting element. Would curing and marinading be enough to change the texture and infuse flavour? any idea if a dehydrator would work instead of roasting? from your experience, If you don't think this could be done.. i'll try to work on some other idea.. but your recipe and techniques look fantastic. Hi Serene, I think I used Colgin brand. Salt roasting steams and concentrates the flavor, giving it a completely different texture from roasting, which uses dry heat. While both produce delicious results, you’ll get a silkier result with salt roasting/baking … I hope you enjoy the lox! One question–do you use coarse or fine sea salt for roasting? I used fine, but I had a heck of a time getting the carrots out. The salt had hardened a lot in the oven, and it took some chipping away to break through (without destroying the tender carrots. I also had a hard time peeling the carrots so I had to leave a few peels on because I’d given up. Also, like the previous commenter, I wondered what type of liquid smoke you used. I think mine is hickory, and it didn’t seem quite right. It was good, of course…just not exactly the smokiness I expected. Andy, looks amazing … I’m so happy you liked! I use fine salt for this, but coarse is worth a try if you were having an issue with it sticking. If the liquid smoke isn’t giving you the right kind of smokiness, you can always try smoked paprika in it’s place. I’ve never tried, but suspect it may give you the result you are looking for. If you do with success, I’d love to know! In your answer to Andy you say that you used fine sea salt although in the recipe itself you say to use coarse sea salt. What is the correct type of salt to use??? Thanks. Janet, either type of salt is fine to use here! My omnivore, New-York born, Jewish husband took one bite and remarked “genius”. His heritage, I suspect, then made him backpedal for a second “Well, I mean, it doesn’t taste, EXACTLY like lox”. I reminded him, it’s not supposed to. It’s a carrot after all, delicious in it’s own carrot-y right. Besides, no salmon were harmed in the making, and it satisfies any salty, smoky, lox-y craving I might have. He agreed, then promptly scooped the last of it on his vegan cream cheese-slathered bagel. “We should always keep a big container of this in the fridge,” he said. Thank you for posting this GENIUS recipe. This is AMAZING. I was a pescetarian before I went vegan, and I’d given up dairy and eggs an entire year before I could give up sushi and smoked salmon. I know now that I can live and thrive without it, but I’d be lying if I said I didn’t miss it sometimes. When my husband brought me home a dozen bagels from NYC, I knew I had to make this. It exceeded all of my expectations. This is vegan magic at its finest! I love that I can have smoky, velvety lox without hurting anyone. I think next time, I’ll put more than a cup of salt on the bottom, so it’ll be easier to remove from the pan. I used kosher coarse salt, and I saved it so I can reuse it. I’ll also experiment with a mix of olive oil and flaxseed oil next time, so I can work some omega-3s into my lox. But it really did come out perfectly as written, and I can’t thank you enough for sharing this easy, accessible method! Hi I don’t have a pyrex dish. Can I use a regular baking pan? I can’t wait to try this! Julia, as long as the sides are high enough to hold in the salt, I don’t see why not! My carrots are SUPER salty. I used quite small carrots and still cooked it for the 90 mins. It still tastes great on the bagel with all the trimmings, but I can’t eat it by itself. Will a shorter cook time make them less salty? Thanks for this recipe (and the blog in general). I’m having a lot of fun with these dishes! Hi Anne, I recommend using large carrots for the bake time listed here. The only reason I can think that your carrots were super salty is that you may have peeled them before baking? Once baked then peeled, the carrots should not be salty at all! Yeah, I just made it today and the carrots are crazy salty. I think for one, my carrots were on the smaller side. And two, I used regular fine salt. I am going to try this again using larger carrots and coarse salt to see if that works. Other than the extreme saltiness, the flavor is spot on. I LOVE that I can have lox now!! YAY! Is the salt roasting necessary? Seems like a lot of extra work. Would roasting them without salt yield essentially the same result/flavor? DM, roasting these in salt essentially steams them in dry heat, which gives them a completely different texture that direct dry heat. Do you think you could sub the carrots for some type of squash? I can’t eat carrots. I came here from Mary’s Test Kitchen. This recipe seems soooo awesome. Since it is sunday today, I can’t buy groceries, but I’m going to try this tomorrow! Can I use just any vinegar for this recipe? Scarlett, I’ve only used coconut vinegar here, but I think you could get similar results with apple cider vinegar or a white balsamic. I hope you enjoy! Hi Erin – is there anything I could substitute for the coconut vinegar? Love your recipes! This is the greatest thing I have ever put into my mouth. Thank you. Hi, can I sub white vinegar for coconut vinegar and regular vegetabke oil or coconut oil for the marinade? Michelle, Sure, I think those subs would work. If you use coconut oil, I would definitely use refined. Enjoy! Ugh, I had to use Hickory Liquid Smoke because I didn’t have any other but after looking it up and adding it to the marinade I found out that you’re supposed to use Alder or Applewood wood chips to smoke salmon or else it’ll smell like fishy bacon….noooooo. I’m actually not vegan, but I love these and have made them several times now. To streamline, and because I care more about taste than texture, I just roast the carrots normally (no salt). I also sometimes don’t get all the skin off, which only really affects how easy they are to cut up. I also add a lot more vinegar to the ratio, as I like them a little more pickle-like and less oily. Liquid smoke is the absolute essential ingredient to these – it really creates the perfect smoked flavor you’re looking for! Oh man, wish I had the patience to make this!! It looks so easy to, I have no excuse other than time! Will need to get my lazy bum into gear! These are so deelish! I am so glad I have found your blog, thank you for these scrumptious recipes. My daughter and I are new vegans, always looking to maintain our quality of food-life. This recipe is simple and straight forward with such a powerful outcome. We were surprised at how good these lox are. I can hardly wait the full day of Marinading in the fridge. I did have a hard time peeling them at first , as I presumed they were peeled with a peeler as per usual with carrots. Once I realized it was easier to pull the skins off with my fingers. The skins came off easily when peeled off like birch bark (around the trunk of the tree). I just made a small slit along the length of the carrot to get a start, then the toughened skins just stripped away. I also added just a touch of sesame oil to the blend, because it was right there, asking me to. I thought it added a deepening to the smokiness, an authentic note to its replication of the salmon somehow. I cannot wait to make holiday brunch lox platters with these! And I would definitely take these to non- vegan family & friends homes and celebrations. Can the carrot lox be frozen? Thanks. Janet, I’ve never tried that,, but I suspect it would affect the texture of the lox (make it mushy). Crazy question here-any chance these would work without the oil? I’m really trying to avoid fat these days. Nicki, I don’t think so. The oil helps give it that soft texture. This recipe only calls for 1 TB of olive oil, and that spreads out into several servings. I just made it tonight and I cannot wait to try it this Tuesday. I actually wrapped the carrots in nori before I roasted them and it added a very authentic flavor! But I cannot wait to enjoy this with Daiya cream cheese and a gluten free bagel! Great idea with the nori, Crystal! I hope you enjoy on Tuesday! We made sushi rolls with this tonight and it was great. Mine came out a touch too salty, either because I couldn’t get very thick carrots or used too much smoke or both. I might also follow the other comment suggestion about apple wood smoke instead of hickory– hickory was fine, but a touch strong. Vin, thanks for the feedback! Maybe if you go for a more coarse salt grind next time, it would eliminate the saltiness? Maybe too the carrot skin was too thin on these carrots? Loved that you used this in sushi! I found you through Sarah’s Vegan Kitchen on YouTube, and just had to try this recipe. Wow, it’s lovely! I recently blogged my recipe for bagels and lox, using my own home-made bagels and cashew ricotta, plus your lox (with my own slight modification). Naturally, I have given you full credit for the lox, and have linked back to this blog post. Was directed here from Mary’s Test Kitchen. I can not wait to try this recipe! Thanks so much for all your hard work inventing recipes like these. Erin, Your recipes are beyond fantastic, they are Amazing. I made your Carrot Lox with a few little tweaks last week (on my blog today with full credit to you) for a vegan friends Birthday and she adored them. Thank you so much for your generosity in sharing the recipe with us food bloggers so that we can recreate them at home. Thanks so much for giving it a try and your very kind comment! I loved that you shared this and it was enjoyed by others. This is one of the main reasons I blog, so thank you for taking the time to let me know about your experience! I’m not vegan, but I’m dairy free. But I’m trying it out anyways because it looks sooo good. I hope you enjoy, Rebecca! I tried this some time ago. I just popped back to the recipe to make it tonight when while scrolling through the comments I realised I must have forgotten to post my own opinions. This is simply, incredibly wonderful. I have adored smoked salmon all my life as has my beloved. After becoming vegan I put things like fish of any kind out of my mind. When I came upon this recipe I thought it sounded promising. You far exceeded my imagination! The taste and texture are shockingly accurate. We were both pleasantly surprised by the similarity to “real” salmon. If I had not made it myself I might have questioned the person presenting it to me. 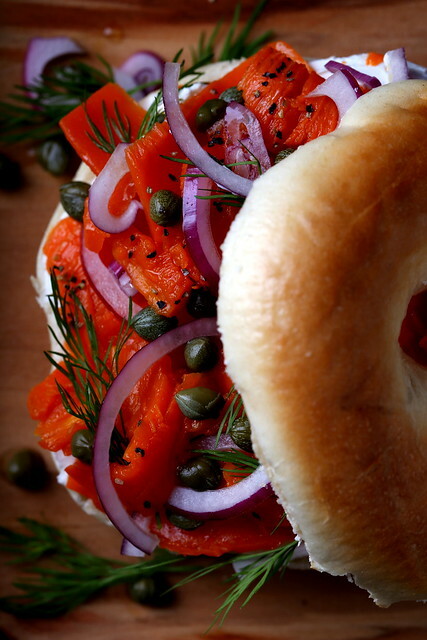 We have thoroughly enjoyed it on bagels with vegan cream cheese, capers. red onions and black pepper. I am making it again with the intention of using it in a spaghetti carbonara-ish, if there is any left once my beloved discovers it in the refrigerator. Than-q for your time and effort in developing your recipes and sharing them with us. Things like this have the potential to remove the “obstacles” many feel when considering eating plant-based and certainly bring pleasure and joy to those already eating plant-based. Have made this recipe 3 times now, love it. You only need a tiny bit as it’s so flavourful, I use it in pasta and also in sushi. Thanks for your kind feedback, Louise … so happy you like the lox and are able to use it in other applications! I did it three times in the last month, soooo incredibly delicious…I microwaved it for 20 minutes at lowest power instead using the oven… and it works for me, thanks a lot for sharing. This is amazing. I tried this week, using kosher salt and hickory liquid smoke. I would love to find a different liquid smoke, like cedar, if that’s a thing. But really, really delicious. Had it on bagels with vegan cream cheese which was delicious. It really really was amazing in homemade vegan sushi. Tasted just like a smoked salmon roll. Thank you for this amazing recipe! So happy you enjoyed, thanks for your kind feedback! Yes, there are different varieties of liquid smoke available, although I don’t think I’ve ever seen cedar. I thought I was never going to enjoy a bagel with cream cheese and lox again after becoming vegan four years ago. Then I made your carrot lox. OMG!!! I’m Jewish, so I’ve had my share of lox over the decades. Erin, with the first bite of pretzel bagel, Tofutti cream cheese, onion, and carrot lox, I thought I’d died and gone to heaven. I was kvelling!! You are my heroine. Your comment made my day! I am SO HAPPY that you love the carrot lox. Thanks for your very kind feedback! Oh gawsh this is SO GOOD! I make this on Tuesday evenings so we have lots for homemade sushi night on Fridays and bagels over the weekend!! THANK YOU!! Has anyone every tried doing this same method with other root vegetables? Turnip? Beet? Just thinking of cool ideas for sushi night. Wow. Thank you so much for this recipe. The lox were amazing! With it and my other plant based bagel garnishes, I’ll never miss the traditional cream cheese and smoked salmon/gravlax. Omg.. I made this for my mother who is a vegan and little brother who is allergic to fish. I made a “mock smoked salmon dip” and it was a HIT! Even the non-vegans at the party couldn’t believe it was carrots. Thank you very much for sharing this recipe. So happy to hear it was a hit … thanks for your feedback, Aida! I’m right in the middle of the marinate step. I have to say that after seeing my sad carrots come out of the salt looking wilted and small, I would slice them first before the salt step. We’ll see how the rest of it turns out, and maybe I needed fatter carrots! Great recipe and thank you. Harlyn, Olive oil does that! Leave it out for 5-10 minutes out at room temp, and it will liquefy. I just want to commend you on making such an amazing recipe. It really tastes, smells, and has the same mouth feel as the real thing and is perfectly paired with the dill, capers, and everything. Even my boyfriend, who eats meat, thinks it tastes delicious and real. So happy you and your boyfriend like, Amanda — thanks for your kind feedback! These are perfect if you add a sheet of nori (powdered) into the oil/vinegar mixture. Helps achieve that “fishy” taste. How long will this last in the refrigerator? Also, would it be okay at room temperature for a half a day. I’m wondering if I can travel with it. Thank you. It lasts about a week in the refrigerator. I’m not sure about leaving it out for half a day … maybe travel with a small ice pack to be safe if possible? Amazing recipe! I used apple cider viniger and it turned out great! I also smoked the carrots on my smoker bbq for extra flavour, then I used the left over “salmon” for vegan sushi the next day with avacado and cucumber in rice paper wraps. Made these the other day and finally had my first vegan bagel with Kite Hill cream cheese and carrot “lox”. So good! I tasted the carrots after one day and couldn’t believe the change from day 1 to day 2 in the marinade. I used apple cider vinegar because I didn’t have coconut vinegar and I added a bit more marinade after day 1. I’ll definitely make this again and I’ll try other veggies salt roasted. Today my dear hubby got me my first bottle of liquid smoke. Can’t wait to try this veggie carrot/salmon. Can I use an other vinegar than coco vinegar? Sushi vinegar? I loved this recipe so much made it twice already! But the only thing is that baking the carrots… Peeling them.. getting the salt sorted has been really hectic. Was wondering have you ever experimented boiling the carrots with salt water (not boil for too long)) then marinate? It might not have that flakey texture though. Hi! Drom me, and from Mary’s Test Kitchen! !1 Great recipe…looking forward to making this!! Oh my these luscious photos are fantastic. I was at a brunch over the holidays and the “real” smoked salmon on the table has inspired me to create a riff on carrot lox. I want to attribute the inspiration to the correct source. I was wondering if you were the originator? or were you inspired by someone else? Thank you! I cant wait to make it. Hi Hanne, I explain this in the post!